There is nothing like a hot summers day and having an ice cold slush puppy or cocktail. Kids love slush puppy's and their friends will too, when they are having a birthday party at the pool. 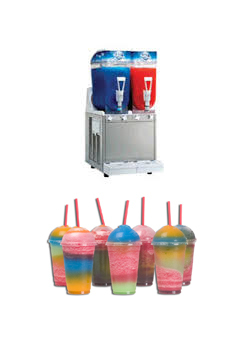 Slush puppy's work well for any function or event that you are planning. We deliver and set up the machine for you. We can include cups and straws for your event. Great for school market days! Put some colour in your event or party!!! 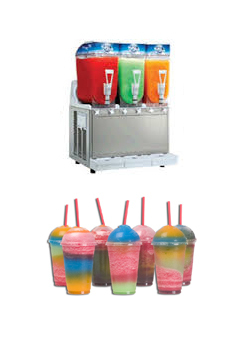 The one day rental package includes 2 x 5L bottles of slush coldrink mixes. Flavours of your choice! We can include cups & straws. Please contact us for more info on the rental prices and delivery & collection fees. The prices may very from the different type of functions. Operators available. The one day rental package includes 3 x 5L bottles of slush coldrink mixes. Flavours of your choice! We can include cups & straws. Please contact us for more info on the rental prices and delivery & collection fees. We can do long term rentals at schools tuck shops etc. Operators available.